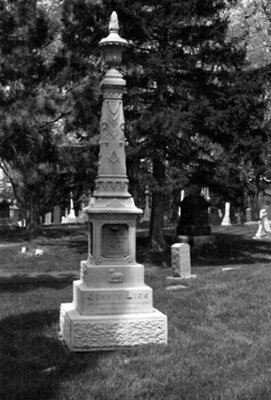 A black and white photograph of Jennie Lick's gravestone in Union Cemetary, Oshawa, Ontario. Jennie Lick was born at East Whitby Township on March 17, 1877. She died on August 30, 1878 at age 1 year, 5 months and 13 days. She is buried in Union Cemetery, Oshawa, Ontario. Jennie Lick was the seventh child born to Jeremiah Lick and Martha McNeal. They had one of the largest apple orchards in the province located on Highway 2/Dundas Street between Thickson and Kendalwood Roads. Jeremiah was a prosperous farmer who served as Reeve of East Whitby Township and as other positions within Council. In 1903 he became the first farmer to purchase an automobile in the area. Gravestone of Jennie Lick, Date Unknown, Brian Winter. Whitby Archives A2013_004_454.